Stress Control: Stress-Busting Strategies For The 21st Century is the latest self help stress management book from psychotherapist Susan Balfour, who has made a special study of stress syndrome with a particular emphasis on the effect of stress on our health and how to manage our stress in daily living. Susan has a private therapy practice in south west London where she works with both individuals and companies and lectures extensively on the subject of stress management. She has been featured on a number of TV programmes about stress and anxiety management, and has worked with leading medical specialists on the management of Repetitive Strain Injury. There are acres of words written on the subject of stress and its management, as just a cursory glance at the Mind, Body, Spirit section both on Amazon and the few remaining UK bookshops (thank God for Waterstones!) will attest. These books seem to fall either into those with a medical focus or the more traditional ‘self help’ tome which offers advice in almost ‘soundbite’ format or has a spiritual focus, which some people may find hard to relate to. Susan Balfour’s book is a happy blend of both styles, combining important scientific information (such as the impact stress has on our bodies) with a frank discussion of how modern life and particularly how today’s society, with its constant drive towards consumerism and acquisition, is affecting us. I found the tone to be no-nonsense and frank, rather like chatting to an old friend who has your best interests at heart. Susan believes that we need to learn from the lessons of the past and ancient wisdom rather than constantly seeking new (and temporary solutions). This is not, however, done in a wishy-washy, navel contemplating way. She proposes alternative approaches to modern problems, for example our addiction to social media and the urge to be constantly connected to our phones every minute of the day! Bullying at work, working from home, excessive workloads, every modern dilemma is included. The book contains 11 clearly defined chapters, each with suggested, easy-to-implement exercises. For example, “Technology and stress” (Ch 4), “Take control of your agenda” (Ch 5), “The Positive No” (Ch 6), “Stress at work (Ch 7) and “Food to empower you” (Ch 10). I particularly liked Susan’s focus on tension releasing exercises, since I have been doing Pilates for the last few months to help a lower back problem thanks to two caesarians just 18 months apart! We can definitely control our stress by the way in which we move our bodies. The book includes a loosening and stretching routine which is easy to do, as well as an exercise to achieve deep relaxation. Finally, Susan talks about what we can learn from successful people, focusing on control, challenge and commitment. I really liked this book which is choc-full of advice. It is not a book to be skimmed through but rather contemplated and digested slowly. Susan reminds us that it is OK for us to prioritise our own health and happiness – something that many busy mums totally forget! So are you stressed? With which of these symptoms can you identify? If you’re anything like me, I’m sure a few of these will ring a bell rather loudly! It is imperative to manage our stress so that we lead happy productive lives and can give our best to those around us – particularly our children! 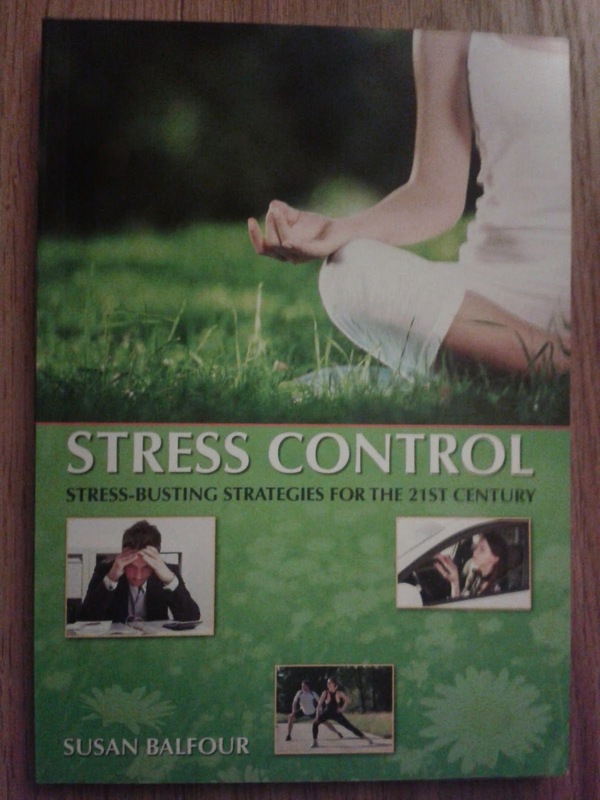 Stress Control: Stress Busting Strategies For The 21st Century is available on Amazon.co.uk at £10.88 for paperback and £4.99 for the Kindle edition. I also have one copy of Susan’s self help stress management book to give away. Just enter via the Rafflecopter app below. The giveaway will close at midnight on Monday 9th March and the prize will be sent out by the publisher. "Great Purse-Friendly Home Gifts For Mother’s Day From Terrys Fabrics"
"Colours of Wales – Caitlin’s Poem For St. David’s Day 2015"
Meditating with your breathing – count five in then five out you soon calm down. I try and use hypnotherapy, it helps quite a lot! meditation, which gets better with practice. Remembering that things will change – including how you feel about the situation. This breathing exercise really works: tip of tongue on ridge behind your top teeth. Breathe in through your nose for count of 4, hold for 7, then breathe out for a count of 8 through your mouth making a gentle whooshing sound. It's very relaxing but only do four cycles at first as you might feel dizzy – increase the number gradually. Count to 20 slowly & deep breaths. Take a short walk and get some air.